As you may have noticed, the insolvency of one of our biggest competitors – foodieSquare GmbH – was recently announced. Thus, a unique opportunity for Foodist has come up. 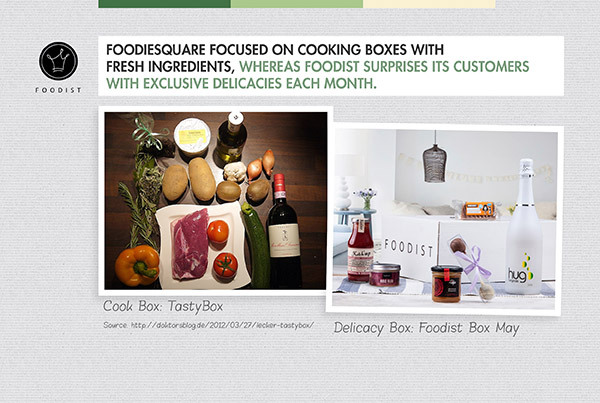 The Munich start-up foodieSquare, which sells the grocery subscription box TastyBox, was founded in 2011. The TastyBoxes of the start-up contained mostly regional specialties made by German producers. Immediately after the insolvency was announced, we contacted the responsible liquidator in order to check whether the existing assets of foodieSquare may be relevant to Foodist. Even though there are significant differences in the business concepts of Foodist and foodieSquare, the target groups are similar. foodieSquare focused on the market for cooking boxes by mainly selling raw ingredients and recipes. On this market, they compete with very big players such as HelloFresh. The margins on this market are significantly lower than in the case of Foodist. Foodist focuses on gourmet surprise boxes, that is, boxes containing ready-made delicacies. Our products can be stored much longer, and the logistics process is different as well. As the first mover and market leader in this segment, we are also facing much less competition. Therefore, the business concept of foodieSquare was entirely different from that of Foodist, but the two target groups overlap. These target groups consist of people who are willing to pay above-average prices for groceries, value transparency in regard to the origins and producers of their food, and are likely to purchase gourmet products online. Our analysis has shown a clear overlap of the target groups. However, we are not interested in the various business concepts of TastyBox, but we are sure that we may convince part of the foodieSquare customers to switch to Foodist. The liquidator has received an offer for the purchase of the customer addresses, the newsletter recipients, the merging of our Facebook pages, and the redirection of the domain foodiesquare.de to foodist.de. For Foodist, the insolvency of a competitor provides a unique opportunity of gaining direct access to a very wealthy customer group that has an affinity for the internet and pays close attention to the groceries it buys. A possible acquisition would significantly increase revenues, the number of subscribers, and the value of Foodist at one go. Since the bidding process is still ongoing, we ask you to understand that we cannot publish the amount of our offer. Generally speaking, however, e-commerce businesses with few fixed assets can be acquired relatively cheaply when they are insolvent. Even in the worst case, the investment will pay off until the end of the year according to our calculations. The first response of the liquidator to the amount of the offer was positive. We will keep you posted on the status of the negotiations.